At the moment, it’s pretty quiet around here. Don’t misunderstand…there’s plenty to do but none of it seems terribly interesting…at least to us. We’ve been doing this sheep/farm stuff for so many years that we tend to do much of it on autopilot. I’ve been looking around for some things that might be new to you. The back end of the ewe tells a story. 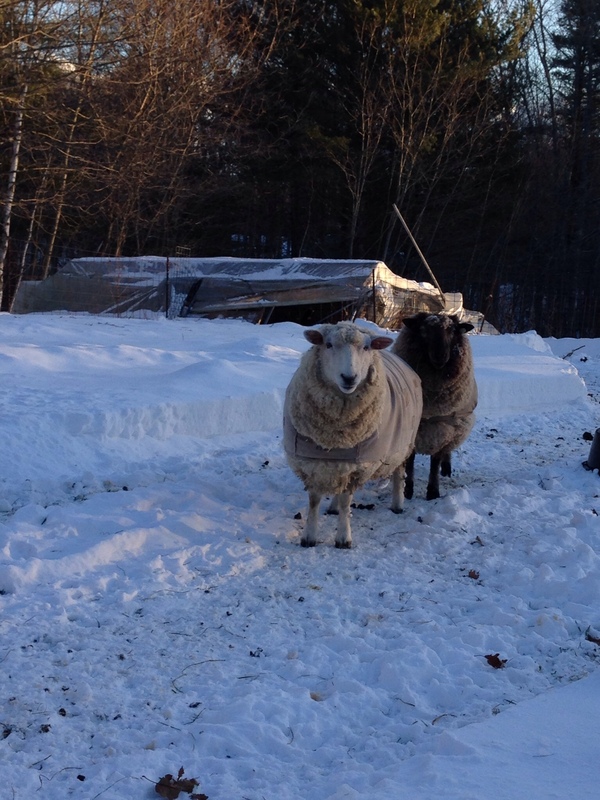 This coat says a lot about where this ewe has been and what she’s been up to… kind of like a sheep passport. The big blue splodge is something to celebrate. It was left there by the ram’s crayon when he had his way with her. Before the ram is introduced to his group of ewes, we truss him up in this harness with a big block of crayon secured to it…poor guy…humiliating. After 16 days (the number of days in a ewe’s reproductive cycle), we change the crayon to a different color. That way, if his attempts to breed her were unsuccessful the first time around, we know it by a second (different colored) mark later on. 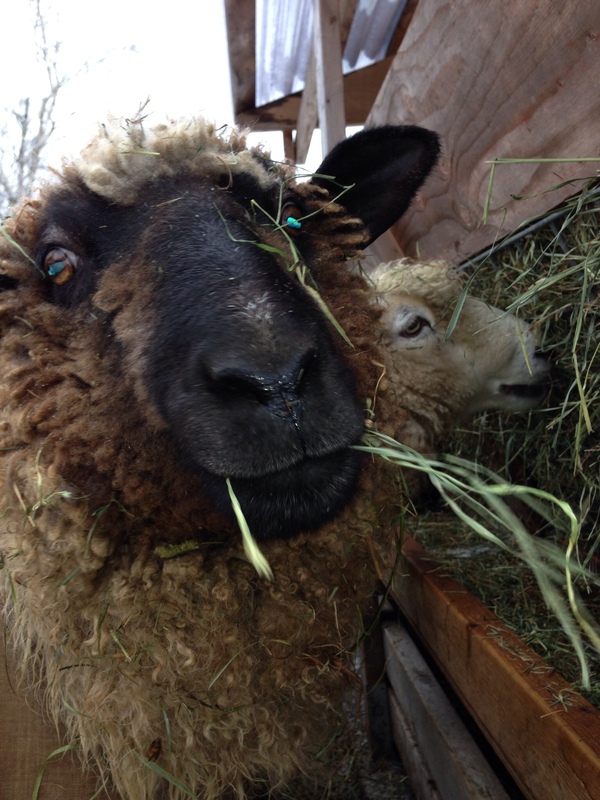 In the case of the ewe in the photo…just the big blue splodge there — BINGO on the first try! YAY! We love it when that happens! There are loads of reasons why but for now let’s just say the ewe gets points for being receptive and the ram gets points for being efficient. I have to mention here…If you’ve looked at the harness link, you should not believe the part about “crayons easily changed.” There is nothing easy about lying on the ground under a 250 pound ram who, at that moment, prefers his ewes to anything else in the world while you fiddle with needlenose pliers, cotter pins and holes that refuse to line up. Oh — and he’s trying to ChaCha on your face! So…what do the other smaller marks mean? They’re the result of “working the sheep” — a term shepherds use to describe gathering a group of sheep together to “do something” to them. We usually pen them in a small area so they can’t run away from us and then walk calmly among them to choose a sheep to “work” on. When we’ve finished with that particular sheep, it gets a mark so we can easily see not to choose that sheep again. In this case, the pink mark means the ewe was given the sheep equivalent of “Frontline.” I had noticed a couple of the ewes rubbing against the feeders and gates so decided to be safe rather than sorry and treat them with a topical debugger. Those little tiny bugs are very difficult to see — and I didn’t find any — but I also didn’t want to risk losing fleeces! 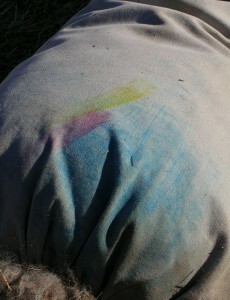 The yellow mark means the ewe was checked for internal parasites (aka worms). We can get a pretty good idea of who needs treatment by looking at the inner eyelid of the sheep. If the mucus membranes are nice and red, she’s good to go. If they’re pale, she needs to be treated because those nasty parasites are feasting on her blood. 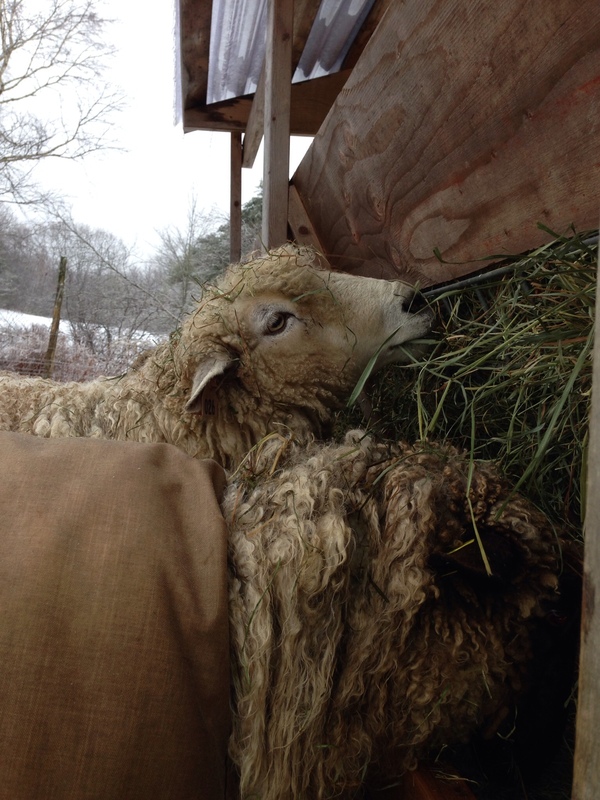 We check the adult sheep every few months…sometimes more often in the warmer months. 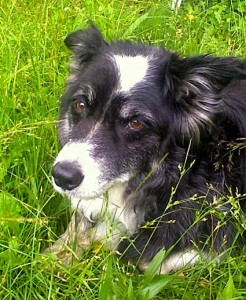 Skye, our Border Collie, celebrated his birthday on July 1 — 13 years! Most people who meet him have no idea he has (major) hip problems…he hides it well. He looks pretty darn good for a “geriatric” (according to his vet) dog. We don’t use the “g” word around here — mostly because we’re all getting there and would prefer not to think about it! On his 13th birthday, Skye'd rather gather the sheep but Jim made him lie down to have his picture taken. Doesn't he look bored?! We had a quiet Independence Day. Jim had come down with a nasty cold and didn’t feel like doing much in the way of running around looking for a parking spot to see the parade. The weather was actually fairly nice for most of the day so we did get a few things done outside. Of course, the minute Jim set out to move the rams into a new pasture, a thunder cell quickly moved right in over Bristol and dumped a load of rain on him. I was at that moment visiting mty friend, Nina, whose goats had just had kids — newbie kids are So cute!! [Sorry..no photos — check out Nina’s blog http://ruitfarm.wordpress.com/] Thankfully, the rain was short lived. Later, we enjoyed a lovely evening with our neighbors — an impromptu supper and lots of laughing. But we skipped the trip into town for the fireworks. But as we said “good night” to the pigs and chickens, we enjoyed the sounds of local celebrations. I woke this morning and something was missing. I couldn’t put my finger on it immediately. And then I realized…no thwip, thwip, thwip — the sound that clogged and dripping gutters make. Hmmm… it wasn’t raining…OMG! Opening my eyes, I’m delighted to find that it’s bright! Even brighter than yesterday! I’m already feeling like my batteries are charging! Might get my herb garden weeded… Woo Hoo!! I’m not sure what I should do first…Oh, right…the Cornishes come first today. 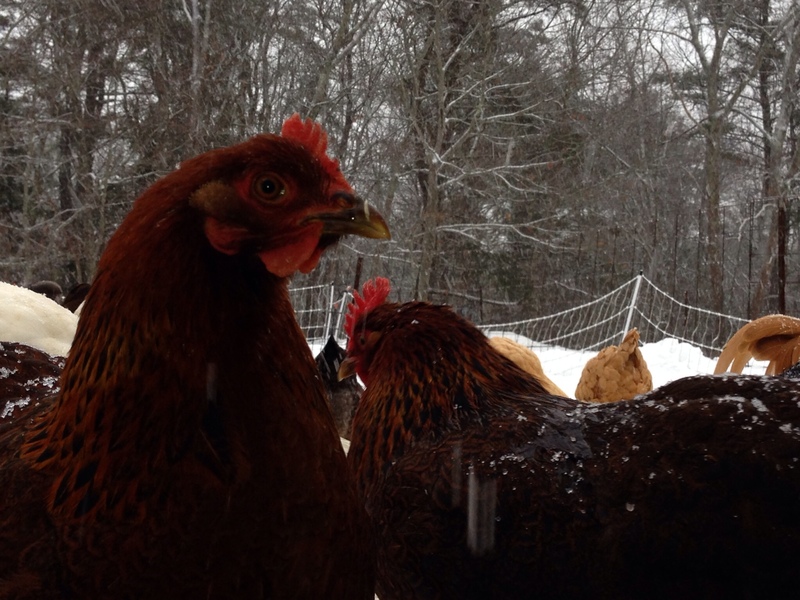 By the end of this day we’ll have have many yummy chickens in the freezer. Just another day on the farm but at least it’s not grey and raining. I haven’t spent any time talking about the rams. It’s not because we don’t pay any attention to them. They’re really very funny and sweet. At this time of year, Jim spends more time with them than I do because of the division of chores. I deal with the hens on a daily basis and he takes care of the rams. But I do visit them to say “hello” and give chin scratches. I’ve often thought it’d be fun to have a flock of rams…just love their personalities but we’ve only ever had Coopworths so I have nothing to compare them to. They’ll almost always accept scratches and stand still while you check under their coats…and oh! 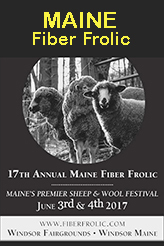 what beautiful fleeces they have!! You know, the ram is 50% of all the lambs he produces so it stands to reason that you want him to be a very spiffy guy! Our boys live in their own little group and even have the best accomodations — a very nice greenhouse. 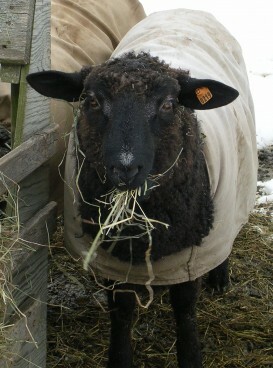 Ram temperament is really important to us and we believe its genetic, at least to some degree. But we also feel strongly that rams are much better behaved when they’re in a group and have playmates. It’s true that for just a small flock of ewes, you really only need one ram but if you keep him alone, he will undoubtedly become a pain…your pain! Sadly, lone rams often end up at the auction because they appear to be mean when in fact, they were just needing companionship. All sheep are flocking animals ie they need to be in a group…this includes the males. Keeping a wether (castrated male sheep) with your ram is an economical way to keep him happy. Choose a wether with a beautiful fleece and selling it will pay for his feed (almost)…and maybe he’ll save you from the emergency room. 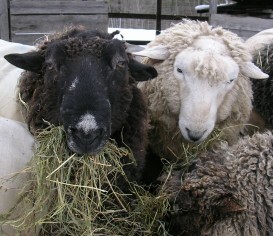 Another approach is to keep 2 (or 3) unrelated rams (intact). 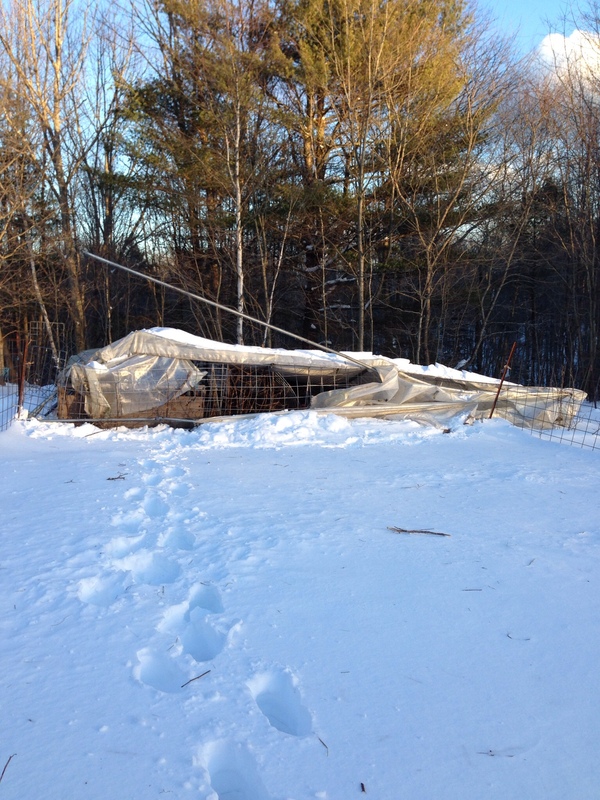 This will initially cost more but if you do, you may still avoid the emergency room, still get big, beautiful fleeces to sell and with good record keeping, you may not have to bring any new animals onto your farm for a number of years. This is a big plus because new animals need to be thoroughly checked for disease and/or parasites, quarantined, etc. and that means more work for the shepherd. In addition, when we disrupt the pecking order by bringing in a new ram, it has to be re-established. This usually means a stint in “the rubber room” — that’s a small stall in the barn with wall-to-wall tires on the floor. The rams have to think about where they’re putting their feet and because the stall is small, they can’t really get far enough apart to do any serious ramming. Usually after a few days, they’ve figured it all out and they’re good to go. But…the less often we have to do this, the happier we are…and I’m sure the rams feel the same way. I think they know something’s amiss. They’re looking at me like “Ah-hem…did you forget something?” I’m trying not to make eye contact. If you don’t make eye contact you can’t give anything away, right? I feel guilty. I mean, they only get one chance each year to “play” and I put the kibosh on that with the decision to skip lambing this year. The boys don’t know yet but 2 of them are going to get lucky. We’re going to send 2 of them off soon. 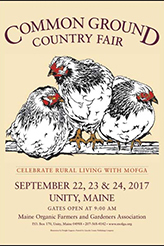 The farms they’re going to are “Hatchtown approved” — one does the same testing we do with the same results. The other has purchased stock only from us and is on an island. Everyone will spend the alotted period of time in quarantine upon return…and then pay the price for having been with ewes. The other rams will know! Their noses know! We don’t normally lease rams for alot of reasons –mostly involving health issues, but we’re confident that these farms will work out OK.